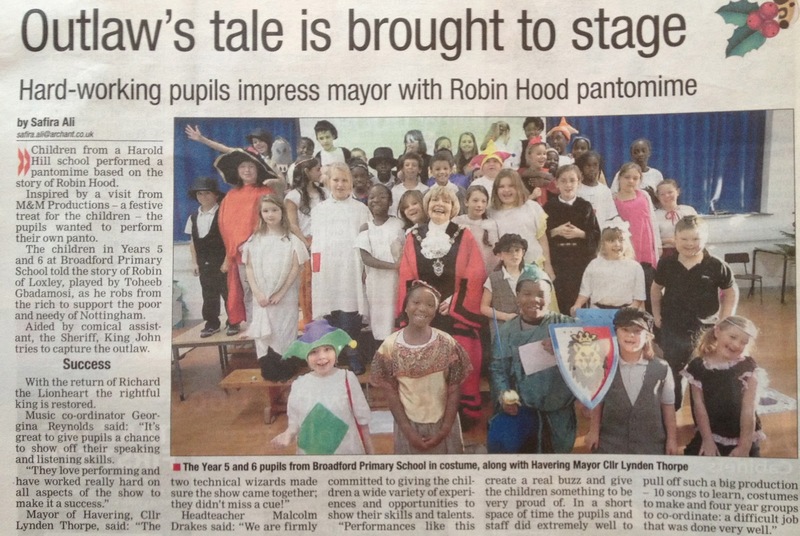 Such was the success of the KS2 performance, that it has made the paper two weeks in a row! 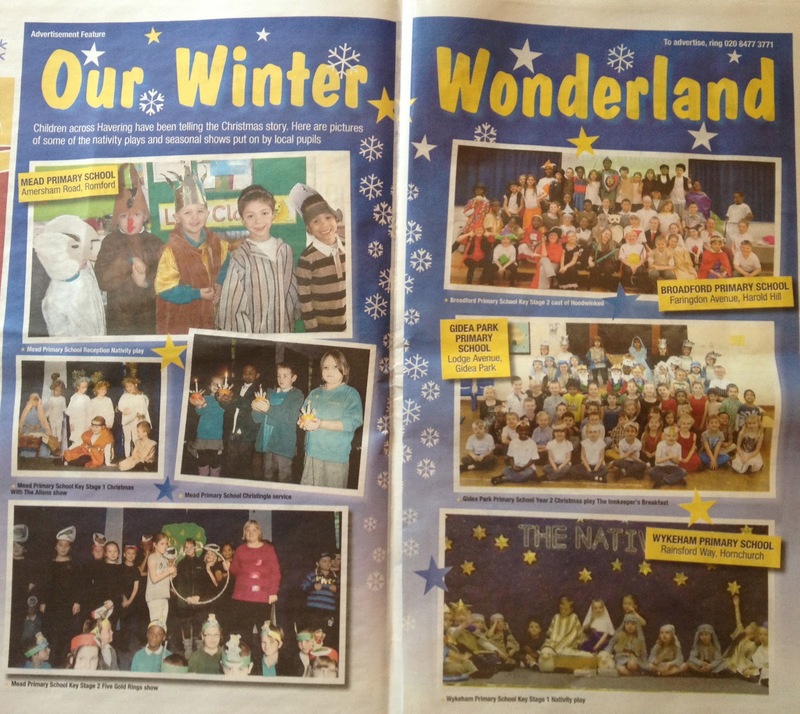 Last week we were featured as part of the Romford Recorder's coverage of school nativity plays. 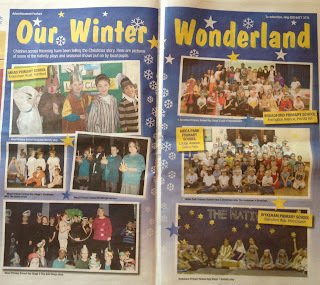 This week we have centre stage on the Press Gang page. 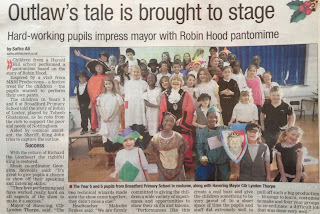 Parents, Governors and the Mayor were all effusive in their praise for the Hoodwinked production. 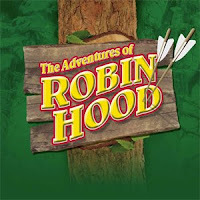 With great songs, catchy music and engaging acting, the children put on a great performance. Congratulations to Cricklade (Green) who managed to win the second half term competition. For the last seven weeks they have been kings of opening doors, tucking shirts, saying please, being helpful and showing kindness to others. A whopping total of 714 points was enough to see off Faringdon house (Red) who were pipped into second. What was the reward for their hard work and effort... vanilla and chocolate cake. More important than that, it was the chance to sit on the stage and sway along to the Queen anthem 'We are the Champions' while the other houses left the hall. In January the contest starts again. Who will emerge victorious next time? Have you ever wondered how much you don't know? Well the BBC magazine has come up with a list of 100 facts that can help reduce the amount of trivial information you don't know about. Packed with interesting gems of knowledge... goats have accents and moths like to drink Chardonnay! Click here to discover the 100 things you didn't know. No family discussion around the festive dinner table would be complete without it. George used the templates on there to design and make this 3-D Eddie Stobart truck. With its colourful paintwork and imposing engine, there is nothing this beast can't haul! If you have a go and make a project of your own, take a picture or bring it into school so that we can all see it. Great job George, we can't wait to see what you make next! 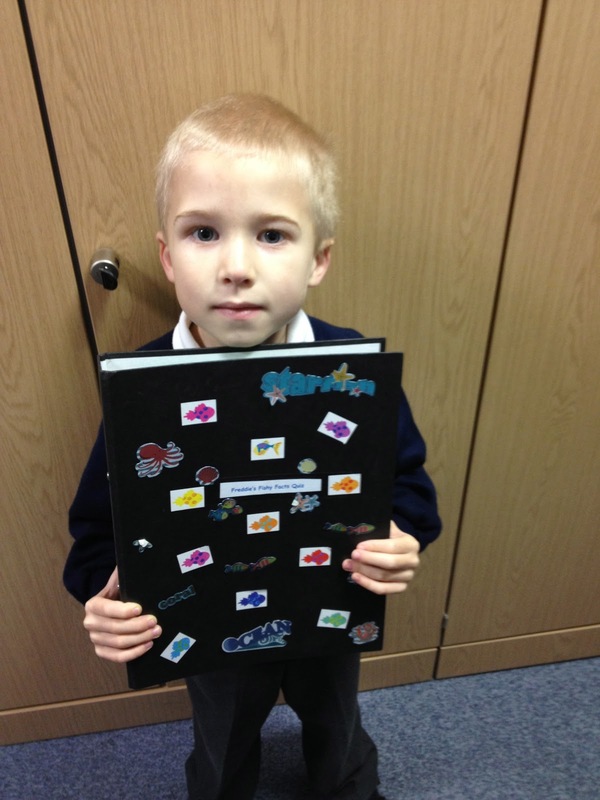 Over the last six weeks, Luis has been busily finding out lots of information about insects. When asked about his work, Luis could tell us an array of information. To make it as visual as possible he complied these collages of his favourite bugs. Meanwhile, Kirsty has been finding out more about Scotland. During the holidays she went up to visit her Grandmother who lives near Dundee. 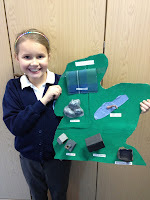 To explain the different locations she has visited to her class, Kirsty constructed a map of her favourite landmarks. Most remarkable of all is that her family has their own tartan design. Kirsty has managed to include a swatch of the fabric on the map for us to see. Great projects Luis and Kirsty, you really are Project Superstars! Congratulations to Green who have managed to win the House Point trophy this week! 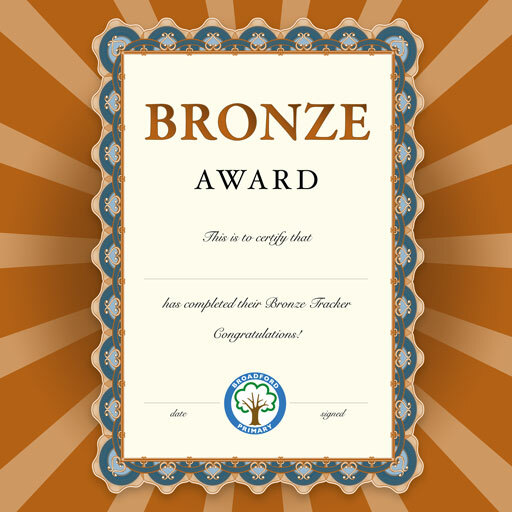 Congratulations to Kirsty White, Simona Raklevicius, Isaac Stevens and Jaseem Miah who have completed their Bronze trackers this week. Kailen Davey have also managed to collect their Silver pencils. 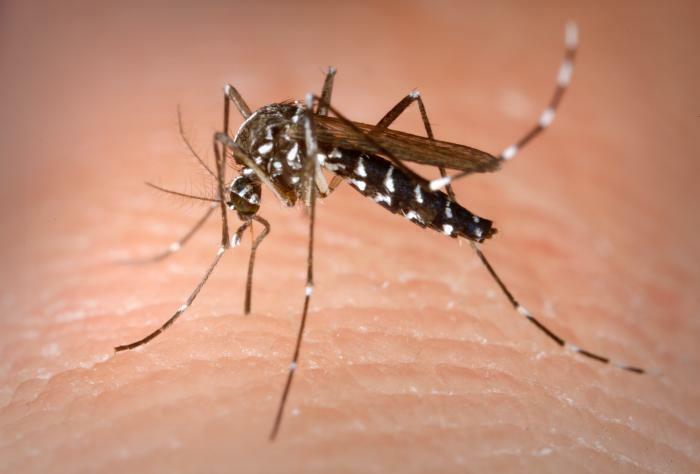 Incredibly mosquitos fly at a speed that is equivalent to 225km per hour! Did you know that the native American clam can live for up to 200 years? For one night only - as there are no contractors on site - we will be collecting the children from their classrooms. DO NOT QUEUE UP FOR THE OLD HALL... make your way round the back of the school through the entrance at the bottom of the hill (the old entrance). You can then collect your children from their classrooms. Review of the Year:In this final newsletter of the year, I would like to thank you all for the support you have shown the school over the last 12 months. Without a doubt this has been a year of quite significant changes and improvements for the school. Emerging from special measures, completing the final part of the new building and posting our strongest exam results for several years have all been developments that have helped to ensure that our pupils and you, our parents, can feel very proud of belonging to our school community. We have been able to make these strides forward, because the raw ingredients – your children – are so well behaved, keen to learn and kind hearted. I strongly believe that 2013 will be an equally fruitful year for the school. We are committed to continuing the improvements so that our school is not just the best on the hill, but the best in the authority. By the beginning of March it is likely that the outdoor area for the Early Years will be completed. It will be the best resourced Early Years area for miles around. New staff are joining us in January so that we can strengthen the support your children are receiving. We have booked quality training for our staff to further enhance their practice and the teachers have already been booking up enrichment activities to maintain the exciting nature of our curriculum. Already in the diary are circus skills days, music workshops, theatre groups, a performance of Pinocchio and trips to London to visit the National Maritime museum and watch War Horse. On behalf of all of us here at Broadford Primary, I would like to wish you all a very Happy Holiday. See you in January! Yesterday we were entertained by the Nursery children. With a mixture of dancing, singing and acting they gave a very endearing retelling of the Nativity story. Please take 5mins to enjoy the highlights from the show! Elephants have a gestation period of between 18-23 months. That means they can be pregnant for almost 2 years! 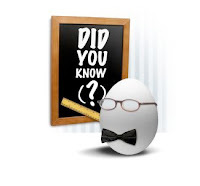 Did you know that the real name for the mafia is ‘Cosa Nostra’? Originally the mafia came from Palermo, which is in Siciliy. Did you know that the planet Jupiter has 63 moons and 4 rings? Scarily you would not get any pain relief if you visited a Victorian dentist. The tooth would be extracted by using pliers to wrench it out. Sometimes poor people sold their teeth for rich people to use as replacements. 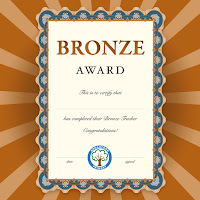 Congratulations to Sophie Hann, George, Ella Wheal, Kirsty White and Alex Wicher who have completed their Bronze trackers this week. Charley McKatherine, Kailen Davey and Amy Mason have also managed to collect their Silver pencils. Again the recent bouts of sickness have had an impact on the attendance figures. 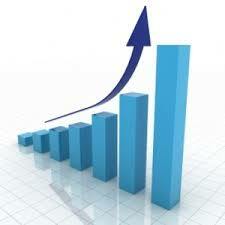 However we are very proud of the continuing improvement to our overall attendance. 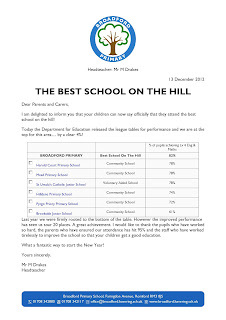 I am delighted to report that we have the best attendance figures on the Hill. This is a direct reflection of your support and the effort you make to get the children here every day. Tumelo amazed us today with some incredible facts about mosquitoes. Becuase of the numbers of people who die from malaria, mosquitoes are the most dangerous animals on the planet - not sharks, lions or snakes! Check out the website below for more amazing information about these tiny creatures. 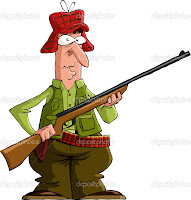 Well done Tumelo, you are a Fact Hunter! Do you enjoy bright, cheerful songs? Would you like to watch a fun filled version of the Nativity story? Are you interested in finding out additional uses for your tea towel? If the answer to these questions is yes, then the Wriggly Nativity is for you. 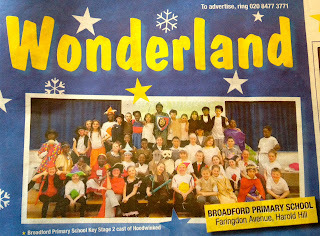 Once again, congratulations to the children who put on a marvellous show for a packed house. Thank you to the mums, dads, aunties, uncles, grannies and granddads who came to watch. Well done to the staff who created the stunning costumes. We arrived at Hornchurch Sports Centre. Altogether - including us - there were twelve schools competing. We were smartly dressed in our school tracksuits. If we wanted to win we would have to do our best. There were lots of events: relays, obstacle courses and field events. Everyone if the crowd cheered for their athletes - we felt very well supported. As soon as the whistle went we shot off like cannon balls. After every race we were worn out. I imagine that it felt the same for us as the Olympic athletes who competed in London. Once the events finished we were desperate to find out where we had come. It was time. We were nervous... very nervous! We stood up when they called our name; all the other schools clapped. 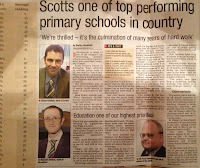 We felt very proud for representing our school even if we did finish at the lower end of the table. It was a great afternoon of sport. 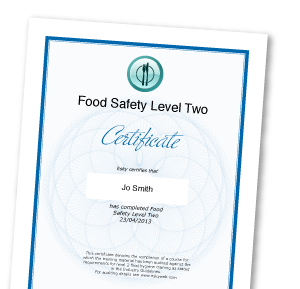 I am delighted to confirm that two of our Friends of Broadford parents have passed the Level 2 Food hygiene test. Well done! This would mean that if they wanted a job in the food industry then they could apply and it is an extra qualification to add to a CV. We are commited to using the FoB to provide meaningful experiences for both parents and children. 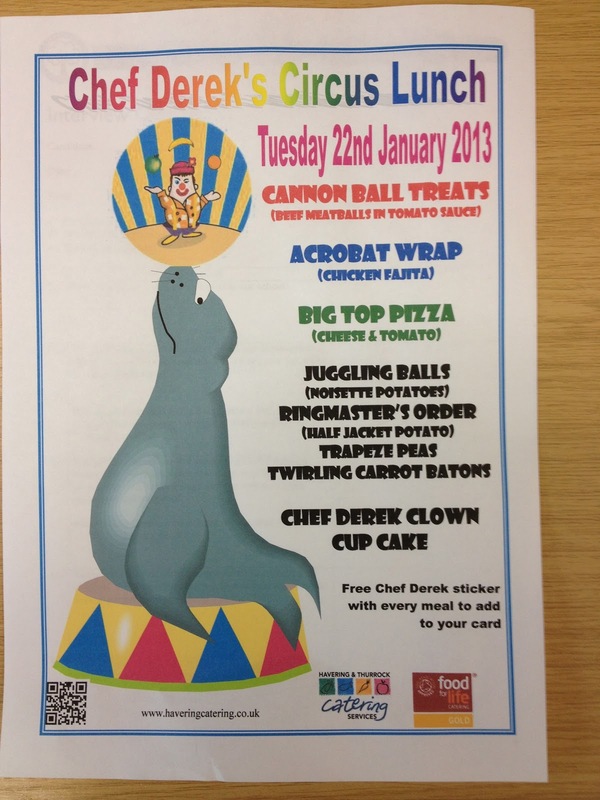 Our pupils benefit as the food sold at events will have been prepared safely. Our parents benefit as they gain transferable skills that can aid future employment. Thank you to Mr Borrell who helped to set this up. We look forward to more opportunities like this in the New Year. 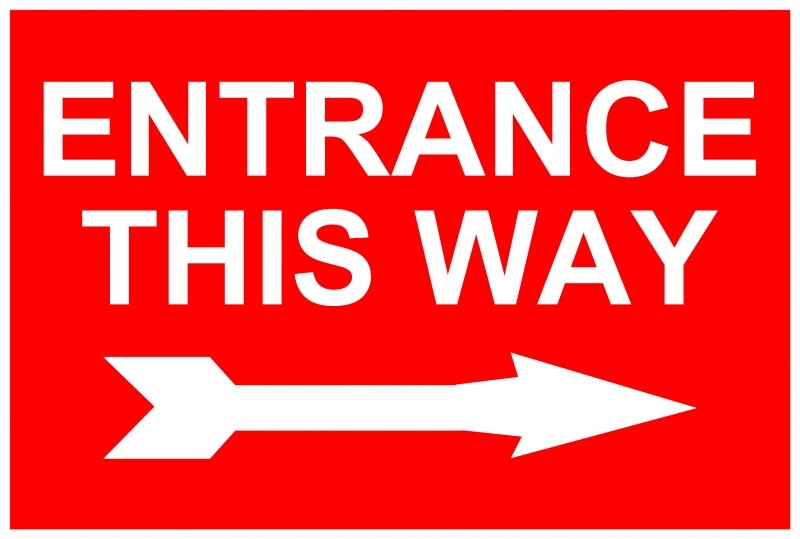 From Monday morning, all pupils will be entering through the school via the main gate for the new building. As you approach the office, KS2 pupils will go to the left and enter as if they were going to a sharing assembly or breakfast club. KS1, Reception and Nursery pupils will go to the right of the new office (entering through the blue door which parents exit from at the end of the day). Nursery parents will be able to go through the blue door on the opposite side of the corridor and take their children down the ramp into the Nursery building. Reception, KS1 and KS2 pupils will all be collected from the old hall, until all aspects of the rebuild have been fully completed. Nursery parents should come to the same blue door as , and you will be able to access the new Nursery classroom via the ramp and outdoor EYFS play area to collect your children at the end of both morning and afternoon Nursery. After the Christmas songs, the children entertained residents with some up tempo songs from their ever growing bank! A huge thank you to Mandy and the kitchen staff who managed to serve 203 delicious Christmas dinners on Thursday. The meal is always one of the highlights of the year. Roast turkey, crispy roast potatoes, chocolate treats and mince pies: all the ingredients that you need for a seasonal feast! For entertainment the teachers and support staff both ate and danced with the children in the hall. We even had a special guest drop in... PC Wayne! Unable to resist the tempting aroma of Mandy's cooking, he came in to have a hot lunch on a cold December day. The E for Excellence assembly was treated to some American style razzamatazz on Friday morning as the cheerleading club performed their latest routine. The children have been extremely dedicated. While many other pupils are still getting ready to leave for school, the girls are in at 8am. With expert tuition from Miss Taylor and Miss Morris, the girls quickly mastered their routine. Do you have what it takes to be a dancer? Could be the next member of this squad? Are you prepared to get up early and make it in for 8am? Are you co-ordinated enough to dance whilst waving a pompom? If the answer is yes, then there are spaces available. Just contact Mrs Charlesworth! We look forward to seeing the children again at the next Choir, Dance & Cheerleading Assembly in February. Thank you for entering the Schools' Competition to design my Christmas card for 2012. The standard of the entries was very high this year and selecting the winner and runners-up was an extremely difficult task. However, I am pleased to advise that your entry was awarded 1st Place and a certificate commemorating this achievement is enclosed. As an additional thank you, I would like to invite you and a parent/guardian to visit the Town Hall on Thursday 24 January 2012 at 4pm to have tea with myself and Havering's Mayor, Cllr. Lyndon Thorpe. After tea there will be a short guided tour of the Town Hall which I hope you will find interesting. I hope that you have a very Merry Christmas and I look forward to seeing you in the New Year. We would like to remind you of the dates and times for the winter performances. Young children are allowed in, but we would ask you to remove them if they become unsettled. Our pupils and staff have worked very hard on the performances and we would not want the children's performance interrupted. We will allow you to photograph and video the children. However I would ask that you focus on your child as much as possible. We shall also be videoing extracts of the performances for publication on YouTube. This means that parents and relatives who can’t make it still get to see their children. 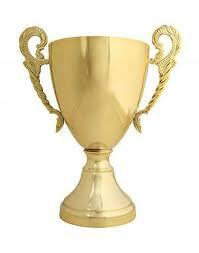 Number 1 for Attendance & Achievement! 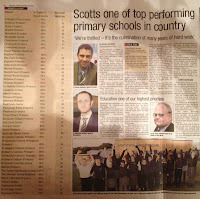 Broadford is number one for attendance too! Further evidence today that our school is a place where children look forward to coming every day. The exciting curriculum, good teaching and fantastic environment combined with supportive parents means that we top the attendance charts as well. 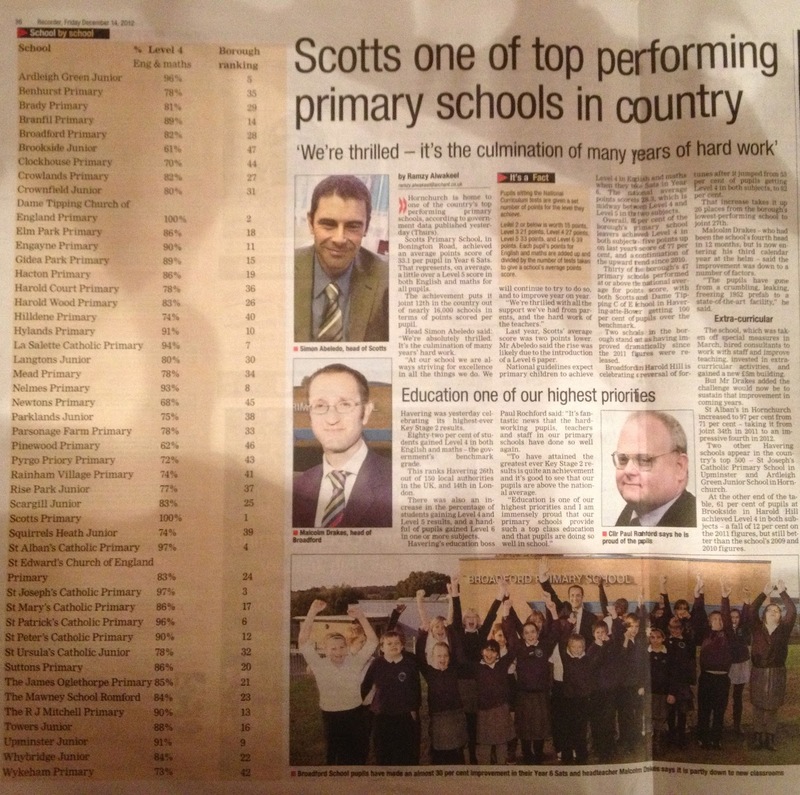 Well done to you, our pupils and parents for ensuring that the children are here every day! To preserve the modesty of the other schools, the names have been removed. 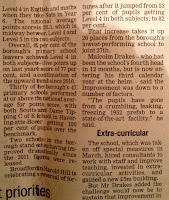 The Romford Recorder contacted us yesterday as they were 'staggered by the rate of improvement' at our school. Broadford in Harold Hill is celebrating a reversal of fortunes after it jumped from 53 per cent of pupils getting Level 4 in both subjects, to 82 per cent. 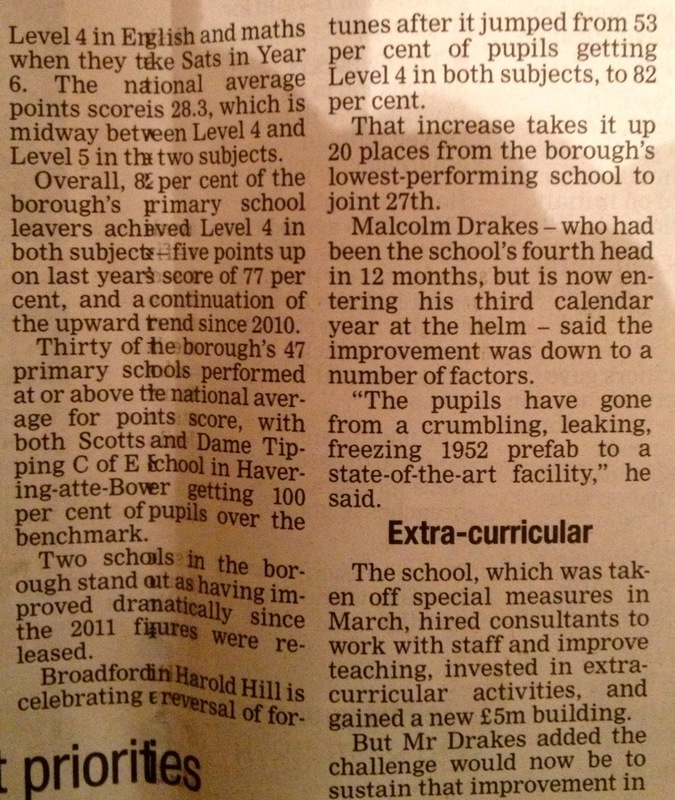 That increase takes it up 20 places from the borough’s lowest-performing school to joint 27th. 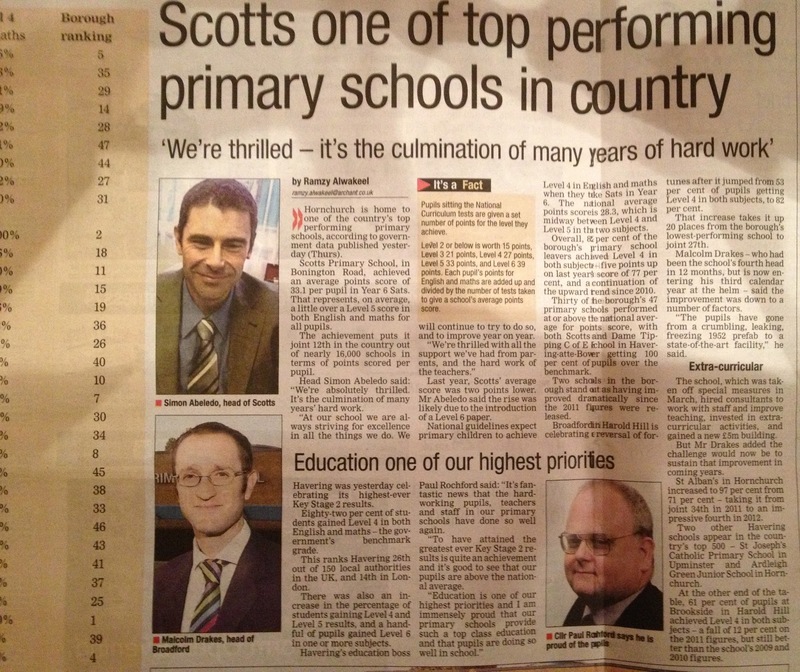 Malcolm Drakes – who had been the school’s fourth head in 12 months, but is now entering his third calendar year at the helm – said the improvement was down to a number of factors. “The pupils have gone from a crumbling, leaking, freezing 1952 prefab to a state-of-the-art facility,” he said. The school, which was taken off special measures in March, hired consultants to work with staff and improve teaching, invested in extra-curricular activities, and gained a new £5m building. But Mr Drakes added the challenge would now be to sustain that improvement in coming years. 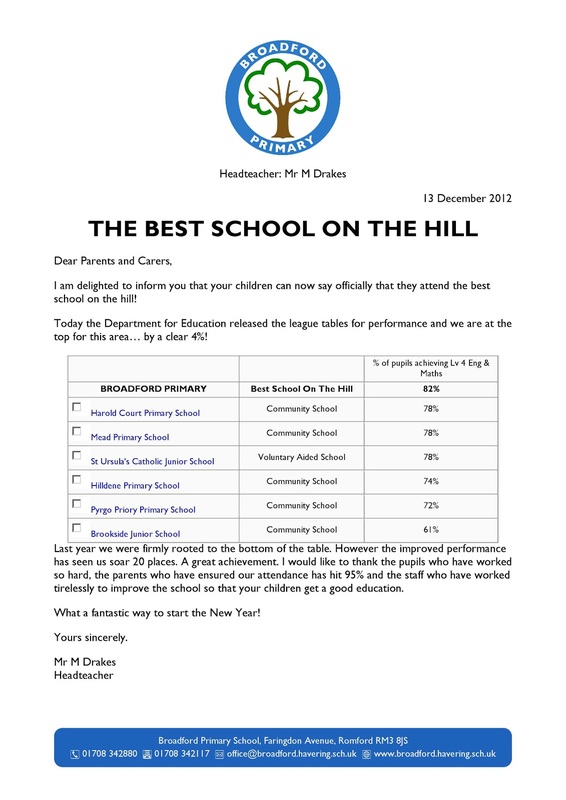 Last year we vowed that we would work to be the best school on the hill. In the last 18 months there has been an incredible effort on the part of pupils, parents, staff and Governors to ensure that quality of attendance, teaching and learning rapidly improved. These results show that the effort was worth it. However we are far from satisfied. We believe that there is plenty of capacity to get even better. We believe that this is the first significant sign of what will prove to be a sustained improvement over the next 3 years... so watch this space! This year our choir have been inundated with requests to perform at community events. Without a doubt, the word has spread far and wide since we sang at the Harold Hill Festival. On Monday the children visited the Cottons Court sheltered housing Christmas lunch. Residents were entertained with a variety of songs: Three Ships, Winter Wonderland and Rainbow Connections. Today the children were singing at the Tripple S housing lunch. Next week they are booked to perform their carols at the Briar Road Action Group Christmas meal - which is being served at the Betty Whiting Centre. Our vision is for the children to be active members of their local community. Harold Hill is fortunate to have so many initiatives running for its residents, and it is great that our pupils get to be part of that. Please find information about the new Grammar & Punctuation test below. A link to the website is included if you wish to find the sample materials yourself. We will ensure that all the Year 6 children are properly prepared for this in the New Year. The VCOP work that the children already do in the Literacy is a great grounding for this type of assessment. A new statutory test of English grammar, punctuation and spelling will be introduced for children at the end of Key Stage 2 from May 2013. This implements an important recommendation of Lord Bew’s independent review that writing composition should be subject to teacher assessment only, with the more 'technical' aspects of English - such as punctuation and spelling - assessed via an externally marked test. The introduction of this new test reflects the Government’s beliefs that children should have mastered these important aspects of English by the time they leave primary school, and that appropriate recognition should be given to good use of English throughout their schooling. The Standards and Testing Agency (STA) is currently developing the test. It will publish a report towards the end of 2012 that demonstrates how well the test meets Ofqual’s assessment criteria for validity, reliability, comparability, minimising bias and manageability. The test will assess levels 3-5 of the current statutory Key Stage 2 English National Curriculum programme of study for English. A separate level 6 test will be available for schools that wish to enter children who are expected to be working above level 5 in May 2013. The level 6 test will sample additional content from the Key Stage 3 programme of study for English. handwriting (subject to final decisions following the results of the technical pre-test). the format of the tests. It also provides some illustrative examples of the types of tasks and questions children will encounter. 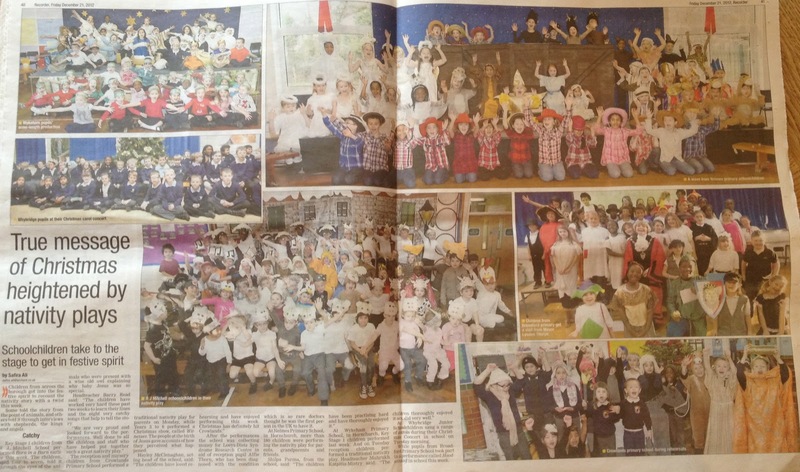 Once again our children have taken pride of place on the Romford Recorder Press Gang page. The newspaper was very interested to hear about the visit from Mike Spoor and the competition we ran for the Dinosaur Anthology. Mike is busy finishing off some illustrations for publishing deadlines, and then he will be producing the sketches for our book. Once it is published we will let you know. Following on from our session with Mike Spoor (which made the paper this week) the BBC are running a program about Quentin Blake. Without a doubt he is one of the foremost illustrators of the modern era. His drawings for Roald Dahl books are some of the most popular ever created. 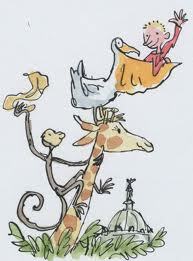 Watch Stephen Smith's full film on Quentin Blake on BBC Newsnight on Tuesday 11 December 2012 at 2230 GMT. Or watch afterwards on BBC iPlayer and Newsnight website. 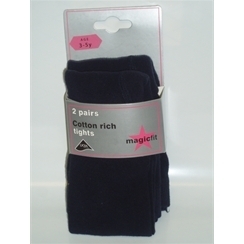 Could I please remind parents that the colour of tights should be black or grey. Recently there has been an increase in the number of girls wearing multi-coloured tights, or ones that are clearly not uniform colours. Visitors to our school always comment on how smartly the pupils are dressed. I would like this to continue. Unfortunately the poor weather and freezing temperatures have started to impact on the attendance figures. This week 3 classes managed to beat the target of 95%. Congratulations to Ash, Willow and Cedar who managed to keep their attendance figures up! In assembly today we spoke about how difficult it is to buy the perfect gift. How do you manage to chose a present that will really show a person how much they mean to you? Is it how much the gift is worth? Is it how difficult the gift was to obtain? Is it how much thought you put into the gift? Is it a special meaning that the gift might have? Is it better if the gift is something you have made? Unfortunately, in our story today, the two people got a bit carried away with the idea of giving presents. James and Della were so concerned about the gifts they were going to buy each other, that they forgot the most special thing of all - they cared for each other! Della shaved off her beautiful hair to buy a watch chain, while James sold his watch to buy his wife some combs! Sadly I know of two other foolish people - Bert & Ernie. Watch their version of the Gift of the Magi to see how they reacted when their present buying went wrong. Remember, you don't have to buy someone a gift for them to know how special they are to you. The best gift of all would be to tell them how much you care about them and to thank them for all they do... something that can be done with a card. The EYFS classrooms are entering the final phase of works. We are now extremely confident that the handover will take place by the end of the week. This will mean our staff can get set up for the beginning of the Spring term. Have a look at the latest photos. The tarmac is going down as we speak and should all be finished by this afternoon. Weaving in and out of cones, stopping for the lollipop lady and collecting items for their back pack, the children had a fantastic time during the scooter and bike training. 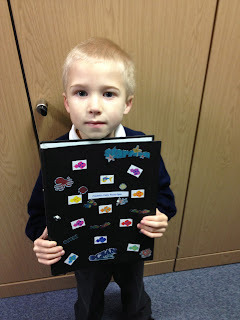 Have a look at the video clips to see the different activities the children had to complete. Congratulations to Green (Cricklade) who have managed to win the House Point trophy this week! The organisers of the Light Up Harold Hill event were very complimentary about the children. Thanks to all of you for your efforts in making yesterday such a great evening for the community in Harold Hill. 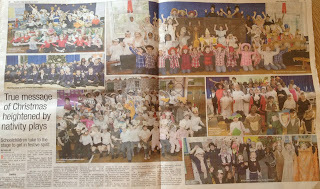 The children were really fantastic with their singing and had clearly rehearsed well ahead of the event. Please pass on my thanks to all of those who took part in singing, and everyone else who involved in supporting them. Do hope you’ll all be keen to do it again next year. Congratulations to all those members of the Broadford Choir who performed brilliantly at the Light Up Harold Hill Event. They sung beautifully – despite the technical hitch which robbed them of the backing music. Dressed smartly in their matching jackets, snoods and beanie hats, our pupils were the smartest ones on show. ‘Three Ships’, ‘Walking in a Winter Wonderland’ and ‘Silent Night’ were the Christmas songs they entertained the audience with. Thank you to Miss Reynolds, Miss Morris and Miss Kemp who helped organize and run the trip. I would like to extend a big Broadford thank you to all the supporters, families, friends and relatives who came to watch the children. Without a doubt we had the best supported choir – not that we’re competitive at all! Next week the choir are performing twice. First they appear at the Cottons Housing Christmas lunch on Monday. They then perform again on Wednesday in Hornchurch. We will video both performances so that parents and relatives get a chance to see the children sing. Only 3 dogs – out of the 12 on board – managed to survive the sinking of the Titanic. Ants work together by following trails left by other ants. This makes it easier for them to find food. If a flea was a human it could jump a staggering 300m! An octopus has 3 hearts! Two pump blood to the gills while the other looks after the tentacles and body. Do you need to finish your Christmas shopping? Would you like to get in the festive spirit with a mince pie and cup of tea? Are you searching for that perfect gift for a loved one? If the answer to these questions is yes, then the Friends of Broadford Christmas Bazaar is the place to go! Stalls include: basketball game, mince pies and refreshments, Year 3&4 craft items, second hand books and christmas gifts. We look forward to seeing you there. 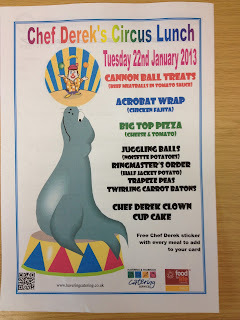 Tudor Lunch Day - 175 children served!